The cost of bleeding your heating system radiators to improve efficiency. The price for each of these jobs will vary depending on where you live within the UK as well as depending on the source of your quotations. Radiator replacement cost, how much should you pay? Radiators are simple to replace if you are making a like-for-like replacement. The main thing to remember is to purchase a new radiator that is the same size as the one you are taking out. Draining the old radiator and removing it from the wall. The plumber may retain the bleeding valve and blanking plugs from the old radiator. If this is the case, they will require cleaning off corrosion. Any pipework modification depending on the style of new radiator. Hanging the new radiator onto the wall brackets, connecting the valves to the adaptors. Opening the valves, filling and bleeding the radiator. For a simple like-for-like radiator installation job, you can expect a professional plumber will charge under £500. Radiator prices included, you should pay around £150 in the North of the UK and around £200-£300 in London and the South East. Replacing a radiator should only take a couple of hours and the plumber should bleed and test the radiator works after installation. Topping up the system with water may be necessary depending on how much water you lose when removing the faulty radiator. Do I need Thermostatic Radiator Control Valves (TRVs)? TRVs are control valves that can be fitted on each radiator to control the flow of hot water to the radiator. You set the temperature required for each particular room; the TRV operates the valve to allow hot water to heat the room and switches off when it achieves the set temperature. Plumbers recommend TRVs because they allow better control of the heating system by setting the different rooms to different temperatures as required. Better temperature control saves you money on heating bills as your boiler no longer has to provide heat for the entire house. Do you find one of the bigger rooms in your home is often too cold? Or perhaps you have knocked down a wall to create an open plan area and the radiators cannot provide adequate heat? The solution is to install an additional radiator to increase the surface area available to deliver heat to the room. In itself, installing an extra radiator is not too complicated. If you have worked with heating systems, replaced a radiator and are comfortable with plumbing, then you can do this yourself. The one thing to bear in mind when installing an additional radiator DIY is the capacity of your boiler. It is important to ensure your boiler can handle the increase in duty and hence getting a heating engineer to do the job for you means they can perform the necessary calculations. In the majority of cases, you heating system is designed to support an additional radiator or two. Prices for installing an additional radiator will vary according to the amount of new pipework needed and the accessibility of the existing pipes. Regional variations, based on where you live in the UK will also come into play. Prices from smaller businesses (sole traders) range from £150 to £200 while you can expect to pay anything from £175 to £300 if you are using a larger company. Installing an additional radiator is a fairly routine job for professionals and should be completed in under a day. Bleeding radiators every year helps to eliminate air bubbles that build up in the heating system pipework. The bubbles affect the efficiency of your heating system by creating “cold spots” in radiators, which reduce the surface area emitting heat into your home. A reduced surface area means you need more heat to maintain the room temperatures over time, which means running your boiler for longer, and consequently higher fuel bills. Bleeding radiators is a very simple task, and with the right tool (often just a flat head screwdriver will do) you can bleed all your radiators in under an hour. However, if you would rather spend an hour of your time on something else, you can always call in a heating engineer or plumber to do the work for you. The plumber will turn the heating system on so that all radiators come on. Next, they will inspect all radiators to see if there is any, in particular, with cold spots. Next, the system is shutdown to prevent the pump from sucking air into the radiator when the bleeding valves are opened. Each bleeding valve for every radiator is then operated in turn until a small amount of water escapes. Once all the radiators have been bled, the plumber will check the water levels in the system, which may need topping up. You should not pay more than £150 for bleeding radiators and in the North of the UK, you may pay just £75 to have this service performed. Now that you have identified you need a replacement radiator or want an additional radiator plumbing in, where do you go to find the best rates? One very competitive marketplace where you can receive up to three quotes from trusted tradesmen is Rated People. Quotatis allows you to post your job details, and interested tradesmen will submit their quotes for carrying out the work. You can then use their prices, as well as reviewing their job history and customer reviews on the site to make your decision. Bought new radiator for the bathroom how much would it cost to get it fitted? Is it a straight replacement or will extra piping be needed? 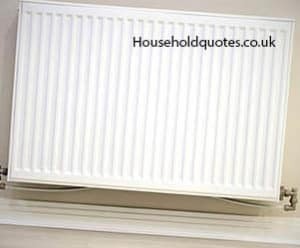 Get Your FREE Radiator Quotes NOW!